Joe’s Organization for Youth (JOY) is dedicated to providing young people with the goods, resources, and services necessary for the promotion of creative expression, work ethic, and optimism. The organization works to make young people confident that, regardless of their conditions, they can thrive and accomplish their goals. Through creative programs, mass toy and clothing distributions, collaborations with civic governments and school districts, and more, the organization strives to relieve young, impressionable youth of the fear that they are unable to pursue their aspirations due to their socioeconomic conditions. JOY provides young people with the tools they need to go after their dreams by allowing them to learn about and experience the various opportunities available to them in the real world. 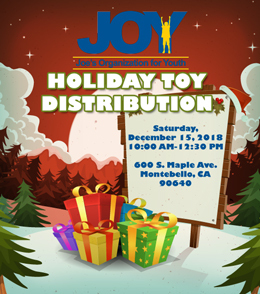 Through toy and clothing distributions every holiday season, the organization ensures that young people experience JOY and understand their worth as members of society. With a “motivation through action” mindset, JOY works to promote a bright, dedicated, and hopeful new generation. To learn more about Patricio Sandoval click here .